Considering the amount of Games Workshop products I cover on my blog, it probably looks like I'm a miniatures gamer at heart; but I still consider myself a boardgamer first and foremost. I do paint, and I do occasionally play tabletop skirmish games such as (the sadly discontinued) Anima Tactics, but I'm usually more at home with something "complete": A game in a box. That being said, Shadow War: Armageddon is my kind of jam. Of course, it's not really surprising. I loved Necromunda back in the day, and as an iteration of that system, Shadow War is a fantastic slice of grimdark fun. It excels in so many ways at so many things; and includes lots of stuff I really enjoy about games in general. I'm not sure I've ever mentioned this, but when I was a kid one of my favourite things to do was create characters for game systems. I made countless heroes for Advanced HeroQuest, and spent hours creating generals for Warhammer Fantasy Battle. I even used to create characters for roleplaying games I never played. Many of my creations never saw battle, but that wasn't really the point. The creation was key. It's no wonder I became a writer. Throughout my life, the things that have often "spoken" to me let me tap into that same creativity, such as video games where you create a party of heroes, equip them with weapons, and develop them over time. One of my favourite things in Warhammer Quest: Silver Tower is learning new skills and gradually evolving the way in which my hero fights. And now there's Shadow War. I've spent several days now, compiling kill team rosters, tinkering with weapon loadouts... just having fun. In fact, as a result of my new obsession with Shadow War I've even done something I haven't done for years: converted miniatures. You see, while I enjoy painting, I don't really enjoy building miniatures. Scraping mould lines is boring and gives me hand cramps. I'm the kind of guy who often builds things exactly as they appear in the instructions, just to get the job done as quickly as possible. And building is only the start. I've been studying combos, running plans, and even coming up with backstory for my characters. I'm having a full roleplaying experience in my head. Nevertheless, as a way of excusing all the time I spent talking to (and playing with) myself, I thought I would share my team build for my space marine scout kill team: The Walking Dead. Scouts are tricky. They are expensive in terms of points, so you don't get many bodies, and while they can take a hit, they are far from indestructible terminators. Furthermore, if any of your team die early, replacing them isn't easy. As with any team, it all starts with a good leader. Mine is Sergeant Michael. Michael was dropped behind enemy lines on a reconnaissance mission that went drastically wrong. He walked away from a bloody massacre with only one other survivor, and he is haunted by those events. Since then he has prowled Armageddon's dark ruins, striking fear into the hearts of his enemies, and rescuing lost souls. As such, his team comprises a rag-tag group of survivors who would (and do) follow Michael into the jaws of Hell. As every member of the team is someone who was lost in action, presumed dead, there are rumours that Michael is a vengeful spirit, and his comrades are undead. Hence the kill team's name: The Walking Dead. 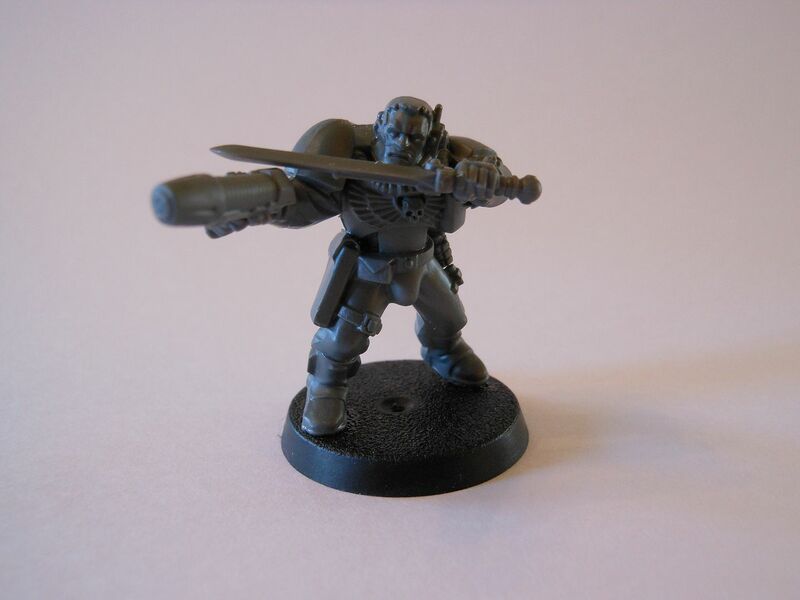 Making a sergeant out of the Shadow War box isn't easy, because the included models don't have options for plasma pistols or power swords. The best you can do is a bolt pistol and chainsword. That wasn't going to cut it for Michael, so I fished out some of my spare bits from Burning of Prospero to see what I could do. Luckily, I had spare hands carrying plasma pistols and power swords, so Michael underwent some minor surgery. I cut off his hands (carrying a bolt pistol and combat knife) and attached the two new ones. The original plan was to pose him looking left, with his sword arm coming across his body and his other arm outstretch behind him. The thought was he would look like a whirling dervish, attacking in two directions at once. However, it looked a tiny bit too much like he was dabbing, so I ended up posing him looking to his right. 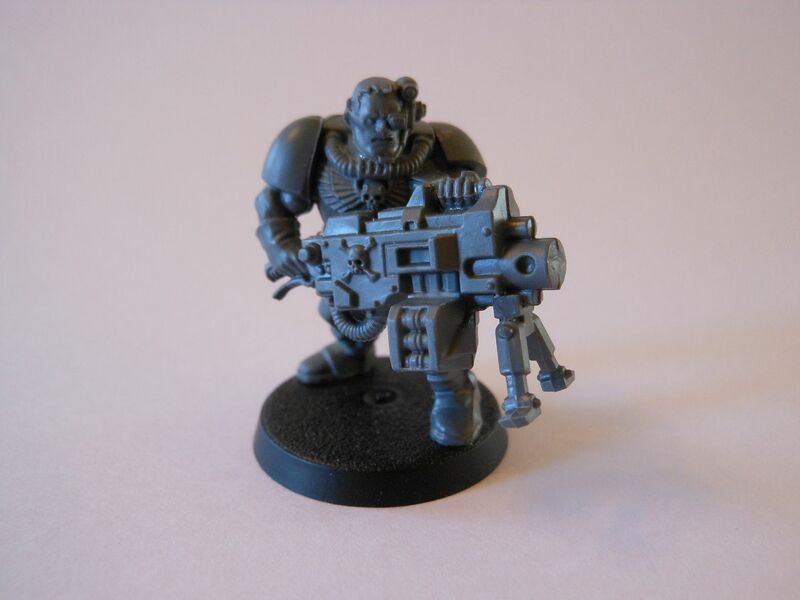 He's holding his plasma pistol gangster style, just to emphasise his slightly unorthodox methods. There are other things I would have liked him to have, but he already weighs in at 300 points, so he's going to have to wait for some grenades. I added some grenades to the model anyway, to save time later on. Next up is Azrael, the only man to survive Michael's fateful mission. He's stuck with his sergeant ever since, acting as a bodyguard and confidante. 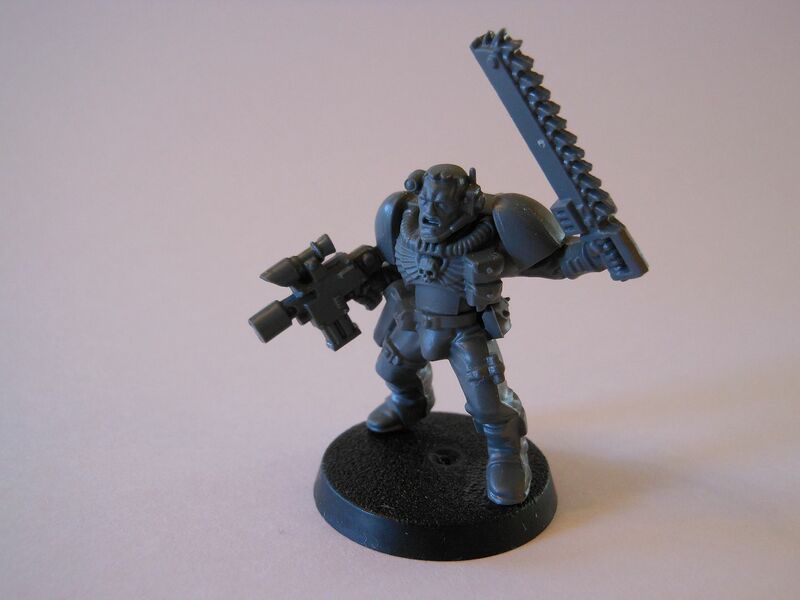 He likes to cover Michael's back, and has the perfect tool for the job: a heavy bolter. There's nothing particularly exciting about the model. I just put a bit more twist on his waist to make it look like he was turning as he fired to spray a wide area. The pose made it difficult to add any ammo packs or grenades to his waist, so I didn't bother. Next up I wanted a sniper, because... snipers. So I introduced Cassiel to the mix. Michael found Cassiel hunkered down in a watchtower. He'd been there for a week, sniping ork raiding parties, and waiting for the inevitable day when enough of the greenskins gathered to rush his position. 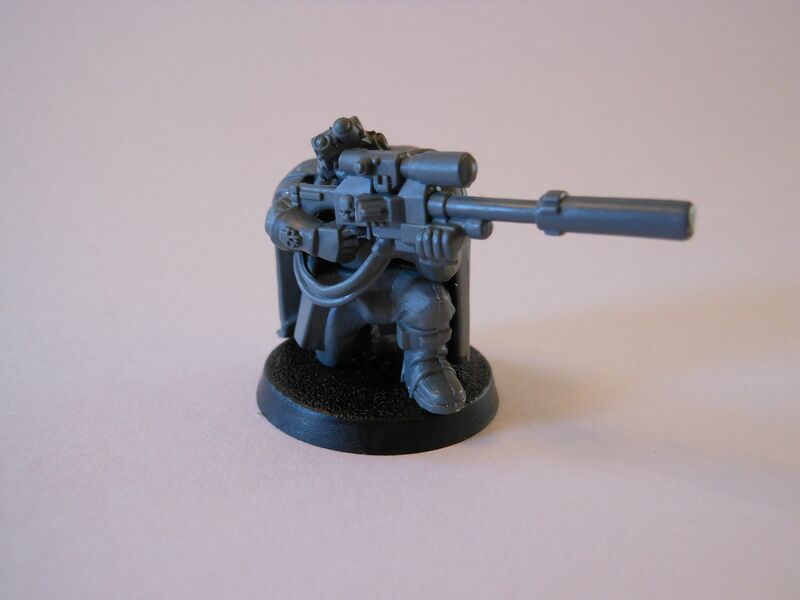 Of course, I chose the kneeling sniper from the scout sprue included in the Armageddon box, because the line of sight rules really work in the favour of small targets. It's a basic build with no modifications. Note how the sniper's goggles are up on his head, making it possible to pose him so it looks like he is peering through his rifle sights. You don't need a gunner class to use a sniper rifle, so Cassiel is a regular trooper costing 100 points. This is a risk, because gunners are 110 points each and you usually only get 100 points to spend between missions. In other words, the only way I will be able to afford another gunner once a campaign is underway is to trade in a prometheum cache for points or rely on good fortune to get some bonus points in other ways. I gave Cassiel a clip harness, because I intend to stand him on lots of tall things, which means there's a good chance he's going to fall at some point. He gets a bolt pistol too, because you can't fire a sniper rifle on the turn you move, so he needs something else to bring the pain. Finally, he gets camo gear, because he's a sniper. At this point, I've got my long range support nailed down, but Michael really needs someone to fight alongside him. Unfortunately, my team is already getting expensive, so it's time to look at bringing in some new recruits. First up is Dumah. He doesn't talk. Ever. Michael found him bathed in gore, surrounded by his fallen comrades, and hacking to bits the corpse of a genestealer with a chainsword he had taken from his dead sergeant. He's kept the chainsword with him ever since, and uses it fearlessly. I want him to be able to stand shoulder-to-shoulder with Michael right from the start, which is why I splurged on a chainsword. Of course, he get's a bolt pistol too. At this point, I really wanted to squeeze a fifth man into the team, because extra bodies are important for campaign play. Of course, it had to be another new recruit, and I didn't really have enough points for decent equipment. So, I ended up with Ahriman, the newest addition to Michael's team. He's a thinker, more than a fighter; although you wouldn't think that from the way he uses a shotgun. He gives the team some extra flexibility, as he can provide mid-range firepower to support his allies as they advance into close combat, or he can race for objectives himself. I spent my last 10 points on extra shotgun ammo, to keep him in the fight. And that's the team, coming in at exactly 1,000 points. So, what's it missing? Everybody needs extra ammo, Ahriman needs a bolt pistol for when his heavy bolter runs out of juice, and I really need some grenades for my close combat guys to help flush out the enemy and break up combat formations. Still, I managed to get five bodies into the team, so I'm already winning. Oh, and as a little aside... In Armageddon, kill teams have access to skills based on their faction, so Blood Angels don't have the same options as Ultramarines... Sorry, Sons of Guilliman. I'm not sure how I'm going to handle that at the moment, because my guys aren't necessarily all going to be from the same chapter. Michael is a Blood Angel, so I will probably just say that everyone generates Blood Angel skills. Then again, maybe I could have characters generating skills based on the chapter they are from. Hmm... That requires some thought. You can start building your own scout kill team with a single box of Space Marine Scouts, available from all good Games Workshop stockists. Great review as usual, but I need some advice. I have a small amount of money and am wondering should I buy a 2009/14 space hulk edition or buy the new shadow war armageddon rule book and immerse myself in kill teams. Now I will be playing these games with my children, eventually... (they are 6, 5, 3 and 1 years old) so I'm playing the long game here. That's tricky. Space Hulk is a superb game (you may already know I reviewed it elsewhere on the site), with some nice colour-coded push-fit models (that I still haven't glued years later). It's very tense and atmospheric, and while each mission is a standalone adventure, they link together in a narrative campaign that tells a story. The rules are relatively straightforward, and while all children are different, I don't see any reason why a six year old who already has some experience with games couldn't play with a bit of help, so you wouldn't need to wait long to start getting games in. On the downside, Space Hulk is really only going to accommodate two players. Sure, you could divide the space marines up, but they die so easily that wouldn't be a lot of fun. It's also very self-contained. There are no real expansions (except some half-hearted and overpriced ebooks GW pushed out a few years back to introduce different types of marines). So, even if you enjoy it, you need to get creative to expand your experience. Shadow War is absolutely amazing (little spoiler for my forthcoming review, there! ), but it's a very different sort of game. As a tabletop war game, you measure distances and the rules are more expansive to cover a lot of different situations. While in Space Hulk you roll a dice to see if you kill something, in Shadow War you roll to hit (which usually involves modifiers based on range, type of weapon, and cover) and then you roll to wound (which usually involves modifiers for the strength of the attack or type of weapon), then your opponent might get an armour save (which usually involves modifiers). It's just a much more dense rules set, which it has to be or the game simply wouldn't be fun. Shadow War is technically a two-player game, but you can run a campaign with everybody having their own kill team so it's like a tournament; and it's also pretty easy to run three-way and four-way fights as narrative missions, although it gets a little crazy. Space Hulk is expensive because it isn't available from GW right now. However, they do release it in limited runs whenever they feel like it. You might be better off waiting until then to get it for a better price (unless you know where you can get a deal now). Shadow War may seem like a cheaper option, but it depends how prepared you are up front. The boxed set is out of print and it's never coming back, but you can get the rules for £25. Tokens, roster sheets, and rules for all but three factions are available for free to download. That means you just need a surface to play on, some terrain, the templates and dice, and some miniatures. That's where things start to get really expensive. If you need terrain, you can easily spend £100+ gathering enough bits to cover a 4x4 area (even if you don't go for the "official" terrain and use whatever you can scrounge together from other war games and cheaper sources). If you need miniatures, you have a bit of control over what you spend, but it depends how far down the rabbit hole you want to go. 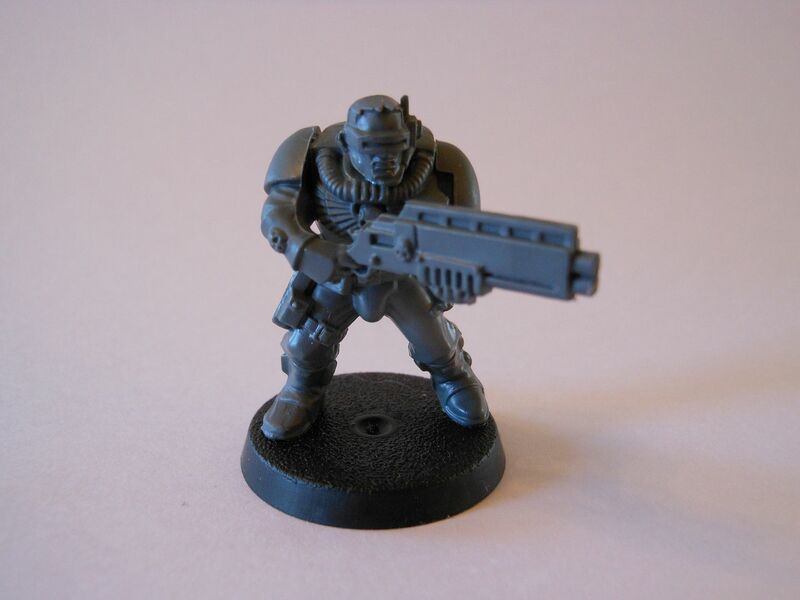 You can start with a single box of scout marines for one kill team (about £15) but that doesn't give you all the weapon options, so you won't have access to missile launchers, snipers, and some of the close combat weapons. You also wouldn't have access to operatives, which can really bump up the bill. You can keep the price down by ignoring WYSIWYG and playing with proxies. Oh, and of course, miniatures in Shadow War and more difficult to put together as they are all proper GW kits. Ultimately, I wouldn't want to choose between them, because they are both exceptional; but Shadow War has the potential to become a "lifestyle" game, while Space Hulk is only ever going to be a great game you play your whole life... There's a difference. Honestly. Feel free to ask me any questions and I'll help if I can. Oh, one more thing... You might want to check out Lost Patrol. It's out of print now, but still available in stores for less than £30. It's not a very good game at all (you can check out my review for details), and I said I would never recommend it to anyone; but it's very simple, making it a good way to introduce younger children to GW. Give them the aliens to play and they'll always win too, so they are more likely to want to stick with it and move onto the more complex stuff. GW also published some extra rules that actually make the game a bit better, and I'll probably write about those at some point. Of course, it helps that Lost Patrol includes a unit of five scouts, which is all you need to start a Shadow War kill team. Yeah lost patrol, I did read your review on that and it apparently does help if you introduce some house rules. Perhaps lost patrol and SWA rule book for the future. Ebay prices in space hulk have come down I feel of late since the re release, so its on my list. You're welcome. If there's any specific information you would like for any GW game feel free to get in touch. I just found out your blog looking for lists to build my scouts. I have no experience with either 40K or Shadow War, so I just wanted to build my scouts using some list made by someone and start trying the game before I build a Tau Kill team. However, checking the book and your list, I don't get where that Shotgun ammon (10pts) is coming from, since there is nothing like that on the Space Marine Scouts Kill Teams rules. Thank you! Hi, thanks for reading. I hope you found the article useful. There's quite a few other articles on the site (regarding terrain, orks, cadians, etc.) if you're interested, so I hope you'll stick around. Regarding shotgun ammo: If you look under miscellaneous equipment, you'll see you can purchase ammo reloads for half the cost of the gun. Shotties cost 20 points, so you can get a reload for 10 points. Hi! Thanks for the reply! I bookmarked your blog immediately, so yes, I'm sticking around. It looks great! Got it!! I didn't realize about the reload! Thank you!